By Vianey Alderete Contreras. 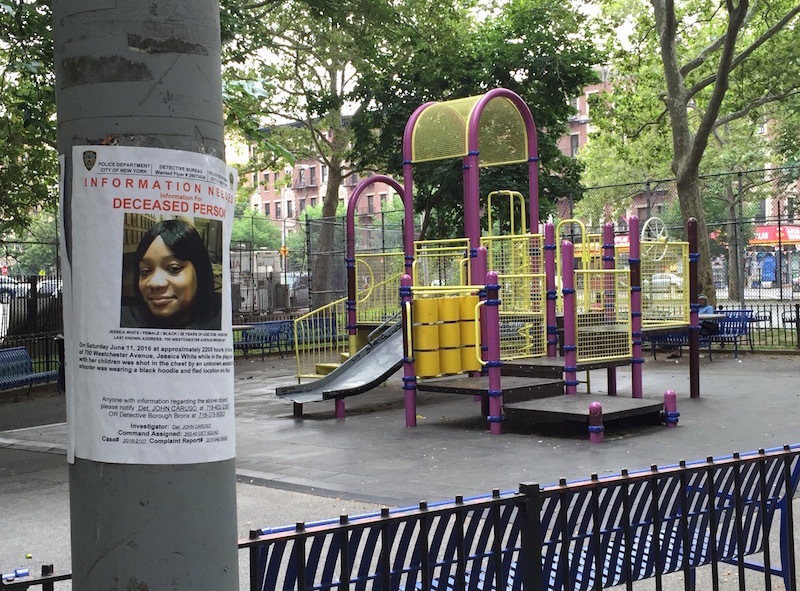 A wanted poster for the killer of Jessica White is hung in front of a playground at John Adams Houses in Morrisania. 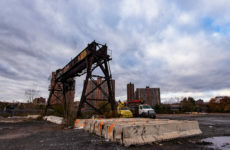 In an email to The Express, a NYCHA spokesperson said that 95 cameras have been installed inside and outside the complex’s seven buildings since the January rollout, in locations determined as the result of consultations with residents. Olatoye announced in January that Adams Houses and other complexes would also be receiving electronic, layered-access control systems designed to keep unauthorized visitors from slipping into their buildings unannounced. Using that system, residents would be able to tap small electronic cards against an electronic reader to get into their buildings, though those devices have not yet been installed. 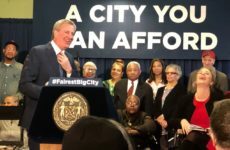 “Cameras are just one part of our comprehensive effort to improve safety, which includes better lighting and security doors,” the spokesperson said, adding that NYCHA has invested nearly $65 million citywide in security measures for its buildings since 2014. But those affected by the violence say that, with or without the help of cutting-edge technology, they feel unsafe. At press time, nearly a month after the murder, Jessica White’s killer has not been identified. Police have released a grainy photo of a man in a hoodie on the Adams grounds, and say the investigation to find the killer is ongoing. A CCTV camera at John Adams Houses. Williams said he doesn’t fear for his or his three year old daughter’s safety when she comes to visit, but that’s because they don’t venture out at night. He says NYCHA and the NYPD should do more to bolster security. 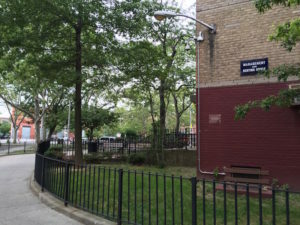 On a recent weekday evening, an NYPD patrol car was parked in front of an Adams Houses playground. “They going to be like that for a while, and then you don’t see them,” said Dorothy Pendleton, a resident of the complex for 22 years. 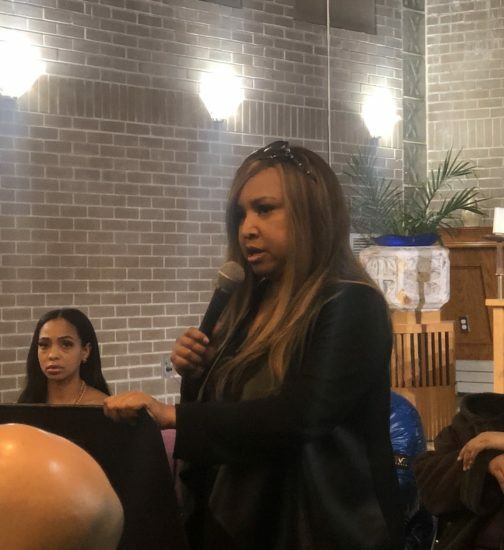 “You see them every now and then, then somebody gets shot and they come back around again.” Given the inconsistent police presence, Pendleton said, the presence of cameras in the lobby her building do help her feel safer. Void said the housing police used to be on site all the time, but not anymore. She never sees them at night, she added. To bring residents into the conversation about safety issues more regularly with law enforcement and housing officials, NYCHA has launched a Public Safety Advisory Committee, but above all, according to Void, residents must take the lead in defusing the ongoing blood feuds that fuel the gun violence. “It don’t matter how many cops we have, if your mind frame and mindset doesn’t change, it’s not going to change anything,” she said.